Surf the web anonymously, mask your location, so no one can trace you. 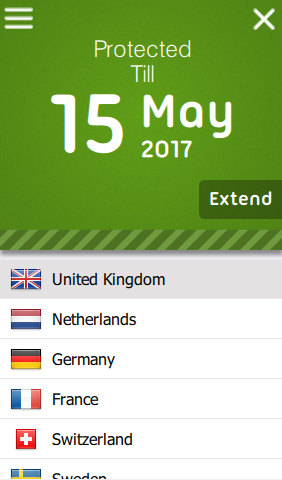 Seed4.Me VPN 1.0.9 (Win&Mac) was available as a giveaway on May 3, 2017! Surf the web anonymously, mask your location, making the geo-IP address different from the real one, so no one can trace you. 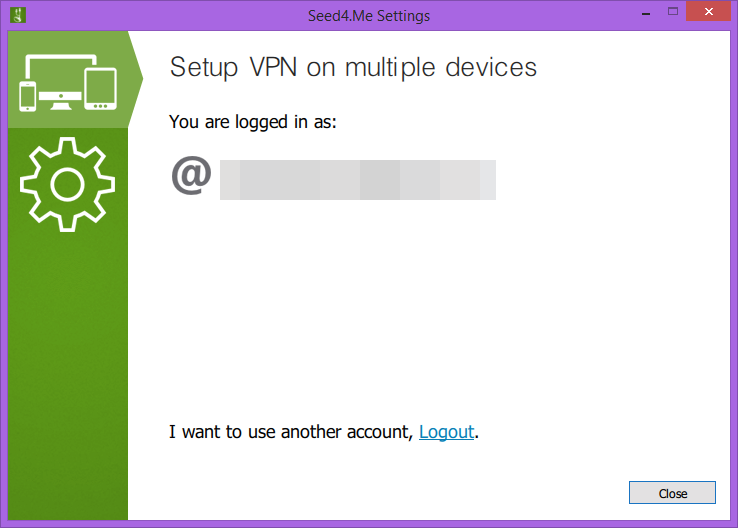 Seed4.Me VPN for Windows and Mac OS also unblocks sites that are normally restricted in the area of your current location. NB:The provided offer is '6 months offer'. One prize will go to the to most upvoted idea(s) on how to improve our app including Mobile and Desktop App. Second prize will go to the person who offers the best motto for our company, considering that Seed4.Me is building security software. Votes won’t play role here, we will chose the best motto ourselves. Unlimited number of prizes will go to bloggers & journalists who cover this giveaway in their blog. Requirements for bloggers: not a fake blog/website, at least one app screenshot and 2 backlinks: one to Seed4.Me and one to GOTD website. Bloggers can contact us alex.z@seed4.me or support@seed4.me directly. Use our Idea Informer widget! See below. How would you improve Seed4.Me VPN 1.0.9 (Win&Mac)? Make the windows desktop application portable. Tested this for more than month. ALL of their servers, ALWAYS are extremely slow! When I say extremely, mean- I fill like there is no internet connection! Will never pay to somebody, to cut my internet. Will newer pay to this company and their product! Tested this for more than month. Bad product! ALL of their servers, ALWAYS are extremely slow! When I say extremely, mean- I fill like there is no internet connection! Will never pay to somebody, to cut my internet. Will newer pay to this company and their product! There aren't suggestions on idea informer? I submitted one MOTTO, therefore at least a suggestion should be present. Hi everybody. :-) There aren't suggestions on <b>idea informer</b>? I submitted one MOTTO, therefore at least a suggestion should be present. Thank you! We will choose the winner on the next week. xilolee, Thank you! We will choose the winner on the next week. No email for verification was sent to the email account that I used to get the download link so I can't connect Seed4.Me to the world wide web. There is no option for me to ask for verification again. Naturally, nothing is in the spam file. I see the developer is very responsive which is often not the case for GOTD developers but there is only 1.5 hours left to get this program working. Don't worry, giveaway will last few days more from now. You can download app from our website, no problem. No code/activation required to get the free time. You can not get email from GiveawayOfTheDay of from Seed4Me? What's your email provider? 1. Please, check your Spam folder and add "support@seed4.me" email to Address Book. Let me know did you manage to do that or not and whether it helped. me and our team will help you to solve the problem. <b>Hello dear Roger, </b> Please log-out and login again into the App on your device, - it will ask - "Do you want to transfer existing VPN access period" - answer "Yes". Let me know did you manage to do that or not and whether it helped. Don't hesitate to contact us directly: alex.z@seed4.me or support@seed4.me, me and our team will help you to solve the problem. Apparently this product uses one of the oldest VPN protocols, PPTP, which is a legacy protocol with limited end to end security, see the article at https://en.wikipedia.org/wiki/Point-to-Point_Tunneling_Protocol for more information. Our desktop apps are powered by OpenVPN. PPTP is just one of the protocols we support and there is a PBK file for Windows you can download and use. So, I suggest using our Desktop app, because PPTP, as you mentioned above, is not as secure as OpenVPN. <b>Dear TK,</b> Thank you for your note! Our desktop apps are powered by OpenVPN. PPTP is just one of the protocols we support and there is a PBK file for Windows you can download and use. So, I suggest using our Desktop app, because PPTP, as you mentioned above, is not as secure as OpenVPN. please create new account, then contact support@seed4.me asking to transfer access time from old account to the new one. Dear Karl, what email provider are you using? Please, let me know your username - alex.z@seed4.me, I will re-check everything on our side. Dear Karl, what email provider are you using? Please, let me know your username - alex.z@seed4.me, I will re-check everything on our side. Is tunneling supported? If not, that would be an excellent thing to add, since it helps those whose online banking, etc, sites will not properly work using a VPN. This is very nice idea to have customizable list of websites you want to visit bypassing VPN, however by default VPN encrypts all traffic. I will ask our developers if this is possible to do that or not. <b>Dear Ed Sterrett,</b> This is very nice idea to have customizable list of websites you want to visit bypassing VPN, however by default VPN encrypts all traffic. I will ask our developers if this is possible to do that or not. <b>Hi dear Anthony!</b> What email provider are you using? Please, let me know your username - alex.z@seed4.me, I will re-check everything on our side. Ok, here's the riddle: "What's always coming, but never arrives? ROFL :) What email provider are you using? <b>Hi Gordon!</b> <b>ROFL :)</b> What email provider are you using? Please, let me know your username - alex.z@seed4.me, I will re-check everything on our side. Looks Good, to bad it's not compatible with Win XP. 2. Contact support@seed4.me and demand your free 6 months. Also ask how to setup VPN on XP, we will send you link to our step by step manual. <b>Dear Stanfi,</b> You can still use Seed4Me on Windows XP with manual setup: 1. Please create your account here <a href="https://seed4.me/users/register">https://seed4.me/users/register</a> 2. Contact support@seed4.me and demand your free 6 months. Also ask how to setup VPN on XP, we will send you link to our step by step manual. Does this provide Ad Blocking? Or, is this even relevant? Connection is fast but when I then use a privacy browser to detect the ip address location, all still identify the original location, not the one that I am connected to. What is Privacy browser? Please, disable location sharing in your browser. If you are using VPN on smartphone try to disable Location services/GPS too. Then open new "private" tab and check your location once again. <b>Hello PhilS,</b> What is Privacy browser? Please, disable location sharing in your browser. If you are using VPN on smartphone try to disable Location services/GPS too. Then open new "private" tab and check your location once again.
" Failed to create OPEN GL context for Qsurface format..... Most likely cause is not having necessary graphic drivers installed. Install a driver providing OPEN GL 2.0 or higher. If this is not possible..."
the rest i did not understand at all. Where can I get the necessary drivers? We have fixed OPEN GL bug, but this version is currently in testing stage. Please email me alex.z@seed4.me I will send you updated version when it's ready. Of course, we will give you +6 months of free VPN. Currently you can use manual setup. <b>Dear lojoba,</b> We have fixed OPEN GL bug, but this version is currently in testing stage. Please email me alex.z@seed4.me I will send you updated version when it's ready. Of course, we will give you +6 months of free VPN. Currently you can use manual setup. Speed is so slow. I can barely watch a 360p youtube clip without pausing...3Mb to 0.55 mb, on a 100Mb/100Mb network. I am thinking it is because of popularity of this giveaway, right now everyone is trying it so it slows the speed. I will give another shoot tomorrow, before removing it from my system. It has no DNS leak, that beats many of the competitor at the field, so I want to use it...Hopefully speed will come to its senses by tomorrow. Speed is so slow. I can barely watch a 360p youtube clip without pausing...3Mb to 0.55 mb, on a 100Mb/100Mb network. I am thinking it is because of popularity of this giveaway, right now everyone is trying it so it slows the speed. I will give another shoot tomorrow, before removing it from my system. It has no DNS leak, that beats many of the competitor at the field, so I want to use it...Hopefully speed will come to its senses by tomorrow. Please, let us know what VPN location do you use and how far is it from the place where you are? Thank you once again for your attention and your messages! 1. Some AOL and Yahoo accounts currently have problems with accepting our confirmation emails and ticket system emails. We are working hard to resolve this issue. So... Please, check your Spam folder + add support@seed4.me to your white list and address book. Please contact me directly - alex.z@seed4.me - if you think we lost your email or our system email was not delivered to you in a timely manner. Invitation code is empty, Please enter valid invitation code. I downloaded this it says to get free 6 months I have to register when I tried to register it says I need an invite code - I don't have one so where do I get one? Failure Invitation code is empty, Please enter valid invitation code. Our app works without registration, it's not necessary. 1. On the top left click on the 3 small horizontal lines. 2. Setting window will appear and there will be text: I don't have an account, Register. <b>Dear hunters,</p> Our app works without registration, it's not necessary. If you need an account, you can create it right from the app without any code: 1. On the top left click on the 3 small horizontal lines. 2. Setting window will appear and there will be text: I don't have an account, Register. 3. Click on "Register". Done! Dear Steve, please contact support@seed4.me and ask how you can get more free time, we have options for your case too. If you use VPN always check for DNS leak. Just Google the same. Some vpn actualy leak your Real IP address. we have DNS leak protection. <b>Thank you Mg!</b> we have DNS leak protection. Thank you Roxane for your opinion! Generally speaking Seed4.Me VPN doesn't show annoying ads, we don't log & sell your traffic data to 3rd party, we have quite fast servers in 17 counties and the S4M team is always ready to help you with any question or problem. Of course maintaining such infrastructure requires some expenses so our VPN can't be free all the time. Also if you enjoy using VPN during free period and need VPN for the next six months or so, - please, extend your Seed4.Me access - we will got you covered. <b>Thank you Roxane for your opinion!</b> Generally speaking Seed4.Me VPN doesn't show annoying ads, we don't log & sell your traffic data to 3rd party, we have quite fast servers in 17 counties and the S4M team is always ready to help you with any question or problem. Of course maintaining such infrastructure requires some expenses so our VPN can't be free all the time. However you can always get more free time by following us, writing App Stores reviews and so on :)﻿ Also if you enjoy using VPN during free period and need VPN for the next six months or so, - please, extend your Seed4.Me access - we will got you covered. Tried to get this to work. About 80% of the time it would not connect. Then I just received this email Your VPN access expired 1 hours ago!. They want me to pay. What happened to 6 months. You all really need to get your act together if you want people to buy your software and service. If your free subscription was lost, please log-out and login again into the App, - it will ask - "Do you want to transfer existing VPN access period" - answer "Yes". If this doesn't help, please contact support@seed4.me or alex.z@seed4.me, we will help you to recover your free time. <b>Dear MJ,</b> Are you in China? If your free subscription was lost, please log-out and login again into the App, - it will ask - "Do you want to transfer existing VPN access period" - answer "Yes". If this doesn't help, please contact support@seed4.me or alex.z@seed4.me, we will help you to recover your free time. My online signin works fine and all directions followed BUT when I click connect button it says Access Expired, Extend. I only installed it today??? Hi Daniel, If your free subscription was lost, please log-out and login again into the App, - it will ask - "Do you want to transfer existing VPN access period" - answer "Yes". If this doesn't help, please contact support@seed4.me or alex.z@seed4.me, we will help you to recover your free time. Thank you Seed4.Me VPN for your honest wording "keep your activities safe & private"..wayy too many VPN's advertise using the word "anonymous" yet contradict that in their TOS. I want to add, that on the one hand, nobody is 100% "anonymous" when he is online, on the other hand Seed4Me VPN still adds a pretty good layer of security. If you are a blogger or a journalist and don't want to be tracked by ISP or hackers in free Wi-Fi, VPN is a good choice. <b>Dan, thank you so much!<b> I want to add, that on the one hand, nobody is 100% "anonymous" when he is online, on the other hand Seed4Me VPN still adds a pretty good layer of security. If you are a blogger or a journalist and don't want to be tracked by ISP or hackers in free Wi-Fi, VPN is a good choice. It's always nice to see developers' replies! The better suggestion I can give to seed4.me is to keep very clear the features of the service, in its own webpage. Encryption type, logging type, number of servers, number of countries, subscription options, payment methods and so forth. Hi everybody. :-) It's always nice to see developers' replies! The better suggestion I can give to seed4.me is to keep <b>very clear</b> the features of the service, in its own webpage. Encryption type, logging type, number of servers, number of countries, subscription options, payment methods and so forth. Thank you for these helpful tips! We will certainly take them into account when redesigning our website. - Our Windows, Android & MAC apps powered by 2048-bit OpenVPN. I have a 60mbps connection, I tested many different locations, United States, Canada, United Kingdom, Netherlands, Russian Federation all were under 10mbps. That would be very bad results, IMO better than nothing but not by much. Thank's for the giveaway. If you are using speedtest app or website, don't forget to turn off Location sharing (GPS) before running tests. In general, VPN bandwidth is shared among other users connected to the VPN node. We constantly increase number of nodes per country to provide comfortable surfing speed. If you need dedicated VPN solution, please contact support@seed4.me, we will do our best to satisfy your needs. <b>Dear Patrick, </b> If you are using speedtest app or website, don't forget to turn off Location sharing (GPS) before running tests. In general, VPN bandwidth is shared among other users connected to the VPN node. We constantly increase number of nodes per country to provide comfortable surfing speed. If you need dedicated VPN solution, please contact support@seed4.me, we will do our best to satisfy your needs. My speed in Australia is only 1.3mbps and I would be overjoyed if I had 10mbps. Waiting for National Broadband Network. Thanks for this useful give away. Patrick Wallace, My speed in Australia is only 1.3mbps and I would be overjoyed if I had 10mbps. Waiting for National Broadband Network. Thanks for this useful give away. I have multiple devices, do I have to register all those devices under my account or do I have to create accounts for each device..... also will be able to goto torrent sites? 1. Sure, you can use one account for all you devices. We have lightweight apps for most popular platforms: you can log into your account in these apps. If the app asks "Do you want to transfer existing VPN access period" - answer "Yes" to sync you VPN access time. If you need to setup VPN manually (PPTP/L2TP), please let us know - support@seed4.me, we will guide you. 2. For torrents, please, use torrent-friendly locations: Switzerland and Sweden. <b>Dear kingace,</b> 1. Sure, you can use one account for all you devices. We have lightweight apps for most popular platforms: you can log into your account in these apps. If the app asks "Do you want to transfer existing VPN access period" - answer "Yes" to sync you VPN access time. 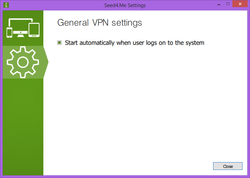 If you need to setup VPN manually (PPTP/L2TP), please let us know - support@seed4.me, we will guide you. 2. For torrents, please, use torrent-friendly locations: Switzerland and Sweden. On their homepage the list asks "does VPN keep logs and the green check mark says YES. Then further down the page it says Strict No Logging Policy. which is it? Dear oerme@sendme, could you please give me more details where do you see this text? We keep no logs on VPN nodes and we'd like to avoid contradictions. If it is not hard for you, could you please contact me directly alex.z@seed4.me to help us eliminate these contradictions? <b>Dear oerme@sendme, could you please give me more details where do you see this text?</b> We keep no logs on VPN nodes and we'd like to avoid contradictions. If it is not hard for you, could you please contact me directly alex.z@seed4.me to help us eliminate these contradictions? Seed4.Me reserves the right to install, manage and operate one or more software, monitoring or other solutions designed to assist us in identifying and/or tracking activities that we consider to be illegal or violations of these ToS's. We may, but are not obligated to, in our sole discretion, and without notice, remove, block, filter or restrict by any means any materials or information (including but not limited to emails) that we consider to be actual or potential violations of the restrictions set forth in these ToS's, and any other activities that may subject Seed4.Me or its customers to liability." They basically reserve the right to install spyware software if they want to if they consider activities to be illegal or a violation of their ToS's no waiting for a law enforcement agency to approach them with a valid warrant/court order... and block content or activites "that may subject Seed4.Me or its customers to liability." "Seed4.Me reserves the right to terminate an account immediately for violating any section of this agreement. In this case, no any refund is possible. Seed4.Me can cancel an account at any time by providing notice to the Account Holder." "•Uploading, posting, reproducing, or distribution of any content protected by copyright, or other proprietary right, without first having obtained permission of the copyright owner"
TK, we use simple firewall rules to block torrents in locations where torrenting is forbidden. We always refund, no matter how many days have passed since the payment: if the payment systems allows to return purchase and Customer is asking for refund, no problem, we do it. Please, contact me directly alex.z@seed4.me and let me know what email you are trying to use, I will re-check everything on our side. Hello dear Goffpop, Please, contact me directly alex.z@seed4.me and let me know what email you are trying to use, I will re-check everything on our side. Always at your service, Seed4.Me team. I'm impressed with the customer service just by the comments! n bowes, Did you install the app before? Please contact support@seed4.me, they will fix it for you manually. n bowes, Did you install the app before? Please contact support@seed4.me, they will fix it for you manually. No problem, we will extend your access manually. Obviously something went wrong during activation. Please contact support@seed4.me and demand free time, don't forget to mention you are from GOTD. <b>Hello <i>n bowes</i>, </b> No problem, we will extend your access manually. Obviously something went wrong during activation. Please contact support@seed4.me and demand free time, don't forget to mention you are from GOTD. TOR is free forever, no registration etc. It uses a modified Firefox browser. Your ISP knows you are using TOR but nothing else. TOR is free forever, no registration etc. It uses a modified Firefox browser. Your ISP knows you are using TOR but nothing else. 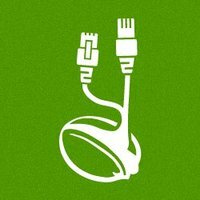 olrowdy01, "Your ISP knows you are using TOR but nothing else." Tor isn't complete system encryption it only changes the IP address, your provider can see what your downloading. Only good for surfing and is slow. olrowdy01, "Your ISP knows you are using TOR but nothing else." Tor isn't complete system encryption it only changes the IP address, your provider can see what your downloading. Only good for surfing and is slow. olrowdy01, TOR is slow, isn't it? You might be thinking of "Hide IP". That is/was a toy. No one, not even the computers in the many TOR transfer points can see what you are doing when using it. It's all encrypted etc. And you should be running https too. If you use Firefox then the add-on, "HTTPS Everywhere" does the job. It's free to try and find out how your system responds to it. It mostly depends upon what your normal Internet speed is. I used to run 0.76 Mbps and I could watch youtube videos with it. Now I'm running 45 Mbps and there is no trouble even with HD videos. The download speed is basically determined by how fast the site you are visiting can put it on the web. Besides, if you want to be truly protected from spying eyes a little reduction in speed is the toll the electrons take to bounce all around the web to get to where you want to go. olrowdy01, The fbi has already cracked TOR so if they want to know what you're doing while using it, it wouldn't be hard for them to find out. olrowdy01, https://duckduckgo.com/?q=tor+comprimised+by+fbi&atb=v61-1&ia=web Enough evidence for you? Considering that the known event happened 3 or 4 years ago to a site that presented illegal videos it is very likely that the site had Java activated. Using Java is a one of the no-no's when using TOR if you want to remain anonymous. At the same time TOR has made changes as needed to the browser etc over the years. But people will still configure their browser in ways they shouldn't. With all the tools the FBI has it took them 4 weeks to finally crack into the info they wanted on the site (from what I read). Most users of the web have a dynamic address which makes them harder to track if they turn the modem off now and then (like when you aren't using the computer). If you are really concerned that someone is out to get you only turn the system on long enough to send/receive the important stuff you are doing. Not too practical for a video site. If you have enough time, money and computer power just about everything is hackable (even if it takes 100 years to do it). Rebeldawg, Considering that the known event happened 3 or 4 years ago to a site that presented illegal videos it is very likely that the site had Java activated. Using Java is a one of the no-no's when using TOR if you want to remain anonymous. At the same time TOR has made changes as needed to the browser etc over the years. But people will still configure their browser in ways they shouldn't. With all the tools the FBI has it took them 4 weeks to finally crack into the info they wanted on the site (from what I read). Most users of the web have a dynamic address which makes them harder to track if they turn the modem off now and then (like when you aren't using the computer). If you are really concerned that someone is out to get you only turn the system on long enough to send/receive the important stuff you are doing. Not too practical for a video site. If you have enough time, money and computer power just about everything is hackable (even if it takes 100 years to do it). ew, and HOSTS file still "respected". States " A required privilege is not held by the client"
Tried to install. States " A required privilege is not held by the client"
Please, let me know did you manage to do that or not and whether it helped? Hello dear kokobin, Please try <b>Right click on the installer > Run as Administrator</b> Please, let me know did you manage to do that or not and whether it helped? I tried this VPN before and had some issues. First, you get disconnected a lot when streaming video or watch a movie on HULU. Second, my online banking can not go through many times do to some security issues popping up from the bank. Third, slow and legging connections and can easy be hacked since the servers are not monitored for such activity. Other then that, you decide whether to use it or not. I tried this VPN before and had some issues. First, you get disconnected a lot when streaming video or watch a movie on HULU. Second, my online banking can not go through many times do to some security issues popping up from the bank. Third, slow and legging connections and can easy be hacked since the servers are not monitored for such activity. Other then that, you decide whether to use it or not. I'm sorry you had bad experience with Seed4Me. On iOS we have automatic reconnect feature and soon we'll do it on Windows and Mac as well. Please contact our support team (support@seed4.me) asking to help you to find the fastest server for you. If the app won't work fast, we will explain how to setup VPN manually and use that server all the time. Dear jim, I'm sorry you had bad experience with Seed4Me. On iOS we have automatic reconnect feature and soon we'll do it on Windows and Mac as well. Please contact our support team (support@seed4.me) asking to help you to find the fastest server for you. If the app won't work fast, we will explain how to setup VPN manually and use that server all the time. About banks: yes, sometimes banks do not allow you to login when they see your IP changed to another country's IP. If you had any other issues, please let me know - alex.z@seed4.me Always at your service, Seed4.Me team. I am getting a 404 error? Could that be anything on my end? Is anyone else getting the same? Don LeBaron, Please request the download link again. It might be because of your changing ip. Alexa Bennett, I am getting the 404 pushing the download button. I cannot download the software. It might be an issue with giveawayoftheday. I have used this site many times and have never had this happen. I cannot see how it could be on my end but the download link is not working. Is there a work around? Thanks. <b>Thanks Alexa!</b> <b>Hello Don LeBaron,</b> I wanted to add that you can try to download installer directly from seed4.me website. Download source doesn't matter, just make sure it's safe. Current app version is 1.0.9 Always at your service, Seed4.Me support. Sorry if I'm missing something obvious but I didn't see on the website what the cost would be if this was the greatest thing since sliced bread & I wanted to continue the subscription past the 6 month trial. Just think that's an important question before GAOTD users choose to spend the time to see if this is a good solution which meets our needs. Thanks. One account could be used on all devices (we also have Mac, iOS, Android and Amazon apps) + traffic is unmetered. Hello Zarf, Here is the pricing 1 week = $2 1 month = $5 3 months = $10 6 months = $20 1 year = $36 One account could be used on all devices (we also have Mac, iOS, Android and Amazon apps) + traffic is unmetered. hmmmm...at the top of this page is a logo/image with $20 striked through and 'free today' under it? Servers in twelve countries to choose from, not seventeen, if the website homepage is accurate. Be sure you read Terms of Service link at bottom of homepage listed above before installation and utilization. we obviously need to update our website :) Actually there are 17 locations, our apps grow fast. Thank you Joshua, we obviously need to update our website :) Actually there are 17 locations, our apps grow fast. Thank you for your attention! Hi, thanks for the opportunity to download and use this software free for 6 months. It installed easily and appears quite user friendly. Could the country locations be displayed in alphabetical order? It makes it easier to locate and select a country when changing or enabling the VPN service. Hi, thanks for the opportunity to download and use this software free for 6 months. It installed easily and appears quite user friendly. If I may make one suggestion. Could the country locations be displayed in alphabetical order? It makes it easier to locate and select a country when changing or enabling the VPN service. Cheers! 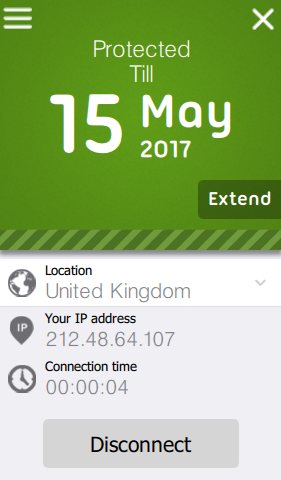 I've been using this VPN for several years, in Thailand and Spain, connecting to a Seed4Me UK server. Thoroughly recommended, and when I've experienced problems the customer support has been second to none. VPN works. see below for info on ip. *ISP can detect it is a vpn or proxy server. *when doing traceroute there are more than 30 hops. timeouts galore. ****speedtest ~ 3 mbs with vpn, 15 mbs without. decreases bandwidth as with many vpn's or proxies. there are better products on the market! you need to pay for them! Your device is obviously leaking your location. To fix it, please, disable location sharing in your browser. If you are using VPN on smartphone try to disable Location services/GPS too. 2. then VPN node encrypts traffic and sends it to your computer/iPhone/iPad, then traffics is decrypted on your device. This is how you get your data protected from snooping & unblock sites. may be bigger then when you are connected directly to the website. To improve the speed of connection, choose the nearest to you VPN location, also you may turn ON VPN protection only when you need it. <b>Hello dear bcook01,</b> Your device is obviously leaking your location. To fix it, please, disable location sharing in your browser. If you are using VPN on smartphone try to disable Location services/GPS too. <b>About VPN speed:</b> VPN connection makes dual path: 1. from the site you visit to our VPN node 2. then VPN node encrypts traffic and sends it to your computer/iPhone/iPad, then traffics is decrypted on your device. This is how you get your data protected from snooping & unblock sites. Because of double path mentioned above the speed of your connection may drop down and so called ping time (time from page request to page response) may be bigger then when you are connected directly to the website. To improve the speed of connection, choose the nearest to you VPN location, also you may turn ON VPN protection only when you need it. bcook01, You are correct, I used it before and got disconnected a lot. tried to do banking online, the bank started popping security issues warnings and at the end uninstalled it. bcook01, You are correct, I used it before and got disconnected a lot. Tried to watch HD movie, got disconnected after few minutes, tried to do banking online, the bank started popping security issues warnings and at the end uninstalled it. bcook01, i think it's vpn slower than your direct connection so the latency increased has nothing to do with ISP. We do not log or DPI traffic. VPN nodes only receive and forward traffic. General connection logs are stored on a secure server for 7 days to solve network issues if there are any. These logs are deleted after seven days if there are no network problems. JohnL, We do not log or DPI traffic. VPN nodes only receive and forward traffic. General connection logs are stored on a secure server for 7 days to solve network issues if there are any. These logs are deleted after seven days if there are no network problems. Seed4Me, Thank you for responding, appreciated. I don't see clear logging policy details. How long do You retain connection logs? I'm asking because name of your service 'Seed4me' suggest torrent seeding mean p2p activity. In example Windscribe vpn provider clears all logs, 3 minutes after disconnecting. And they are p2p friendly. Last question, can I setup Your vpn on linux using Fruho (vpn manager)? Installed whiteout any problem, nice to see a many locations :) I don't see clear logging policy details. How long do You retain connection logs? I'm asking because name of your service 'Seed4me' suggest torrent seeding mean p2p activity. In example Windscribe vpn provider clears all logs, 3 minutes after disconnecting. And they are p2p friendly. Last question, can I setup Your vpn on linux using Fruho (vpn manager)? 1. We do not log or DPI traffic. VPN nodes only receive and forward traffic. 2. For P2P (torrents) please use torrent-friendly locations: Switzerland and Sweden. By default we give 1 simultaneous L2TP/PPTP connection, but it can be upgraded upon request to support@seed4.me (it's free). Please, drop us a message if you have any questions or problems. Hello Stopnachodzcom, Thank you for your questions! 1. We do not log or DPI traffic. VPN nodes only receive and forward traffic. General connection logs are stored on a secure server for 7 days to solve network issues if there are any. These logs are deleted after seven days if there are no network problems. 2. For P2P (torrents) please use torrent-friendly locations: Switzerland and Sweden. 3. We utilize modified OpenVPN 2048-bit protocol so it works with our VPN Client only. However you can setup L2TP or PPTP VPN manually. Here is step-by-step example for Ubuntu: https://seed4.me/pages/setup/vpn-ubuntu-l2tp By default we give 1 simultaneous L2TP/PPTP connection, but it can be upgraded upon request to support@seed4.me (it's free). Please, drop us a message if you have any questions or problems. Could you please give us a little bit more details regarding the problem? The app doesn't start or you can not connect to VPN on MAC? albie , There's a separate link for the Mac version under the screen shots. Thank you for such a great free offer. 6 months? just 141 days, until Sep 21st..
Did you install our app before? I believe it should be November, please contact support@seed4.me, we will fix it for you manually. <b>Hello Pica, </b> Did you install our app before? I believe it should be November, please contact support@seed4.me, we will fix it for you manually. More importantly though: never heard if the providers of this service keep logs. Apologies if I'm missing something here, but as the provider seems more interested in talking about clubs and invitations than about the actual functioning of this service, I'll pass. Thanks, GOTD, but no thanks. Never heard of any 'private club' running a VPN. Never heard of 'by invitation only', either: https://seed4.me/pages/about More importantly though: <b>never heard if the providers of this service keep logs.</b> Apologies if I'm missing something here, but as the provider seems more interested in talking about clubs and invitations than about the actual functioning of this service, I'll pass. Thanks, GOTD, but no thanks. If you want to use VPN on another device, you can create an account to sync VPN access time. No invitation needed to do that if you do it from the App (Desktop or Mobile). Invitation codes are mostly needed when someone wants to setup VPN manually. Hi MikeR, Let me clarify this. No registration needed to use the App, simply download and enjoy VPN :) If you want to use VPN on another device, you can create an account to sync VPN access time. No invitation needed to do that if you do it from the App (Desktop or Mobile). Invitation codes are mostly needed when someone wants to setup VPN manually. vpnmentor is wrong, I will ask their admin to fix it. Thanks Patrick! vpnmentor is wrong, I will ask their admin to fix it. Downloaded & installed without any problem. Once installed went through the registration process, but couldn't see anywhere to enter reg code, but it looks as it it registered itself. On testing Seed4.ME showed that I was connected and displayed a fake IP address, however couldn't access the internet at all whilst running this software, tried adjusting what few options there are but still unable to connect to internet. I suppose not being able to access the internet is a really good way of not being tracked. Not going to waste my time with this. Uninstalled. DaveC, did you restart your computer after installing most of the time this is needed or maybe its being blocked by the firewall of AV . DaveC, Exactly the same situation than you. Gives a new ip address but can not connect to the internet. Try with different countries without success. I am on windows 10 64 bits. 1. What device you are using (PC or Android)? 2. What VPN location did you use? DaveC, to complete my last comment, I found a complete review of this software on may 2015. Since it's old review, maybee seed4.me change something in their software. In any case, it does not work for us. It would be nice to have feedback from other people. Let me know what IP does the program show? We will check this VPN node. Please, contact me directly alex.z@seed4.me we will take a look at the problem with our developers team ASAP. Hello dear Detenova, Let me know what IP does the program show? We will check this VPN node. Please, contact me directly alex.z@seed4.me we will take a look at the problem with our developers team ASAP. Running of Win 10 64 and have tried using Chrome (with & without data saver), Edge, Firefox and even IE, configured firewall to allow access in each case. Tried all available VPN locations and in every instance couldn't connect to internet with your software active, connects when software deactivated. To my mind the issue lies with the software. I appreciate you trying to help, but by my way of thinking if I obtain a piece of software, I accept that I might need to tweak it here and there to fine tune it, but having to waste nearly an hour and being unable to get it to work is simply not worth it. I dare say if I ran a diagnostics I'd be able to sort it out but don't have the time or the inclination to do so. Seed4Me, Running of Win 10 64 and have tried using Chrome (with & without data saver), Edge, Firefox and even IE, configured firewall to allow access in each case. Tried all available VPN locations and in every instance couldn't connect to internet with your software active, connects when software deactivated. To my mind the issue lies with the software. I appreciate you trying to help, but by my way of thinking if I obtain a piece of software, I accept that I might need to tweak it here and there to fine tune it, but having to waste nearly an hour and being unable to get it to work is simply not worth it. I dare say if I ran a diagnostics I'd be able to sort it out but don't have the time or the inclination to do so. DaveC, thank you for your review! PLEASE contact me - alex.z@seed4.me I will explain how to collect app logs to understand why VPN fails on you Win 10 64-bit system. We will provide more free time to you for helping us, no problem. DaveC, thank you for your review! PLEASE contact me - alex.z@seed4.me I will explain how to collect app logs to understand why VPN fails on you Win 10 64-bit system. We will provide more free time to you for helping us, no problem. I look forward to your reply! The provided offer is '6 months offer'. Ummm ... " .... . The provided offer is '6 months offer'. Ummm ... " .... .